There's a move at the end of this character reveal that made me wince and go "Ooooh…." 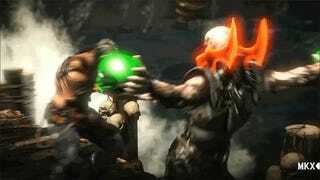 Quan Chi, I've always hated you. After teasing series creator Ed Boon teased Mortal Kombat fans for two days on Twitter, a new video reveals the return of the fighting game franchise's demonic necromancer to the upcoming Mortal Kombat X. The clips shows off the different skills in Quan Chi's Variations. I particularly like the way that his teleport moves make it seem like his arms and legs are really disappearing and reappearing inside of the dimensional rifts. And, by like, I mean I know I'm going to hate getting nailed by those moves. And the bit that looks like the beginning of a Fatality... just super-insulting.